Using time as a metric, Dennis’ Barber Shop is a Freret Street institution, operating for 57 years. Such longevity is an accomplishment on this street that barber and current owner Dennis Sigur said is “completely different” from when he started working at the shop 47 years ago. Sigur attributes his success in part to the community bonds of his mostly African-American clientele. Some families have come for generations. Other customers travel from places as far as Texas for haircuts. The barbers take their role as leaders in a community center seriously, especially as they see that community change. What they say can carry weight. Norwood said he does not give advice without researching it and tries to remain neutral in all situations, especially concerning gossip. As he speaks, the other barbers, Sigur and Karl Stockman, nod in agreement. Dr. Eric Griegs, a community health educator and physician, sometimes stops by the shop to perform health checks, providing medical treatment to people who, Norwood said, might otherwise be wary of a doctor. Using health care information he learned from Griegs, Norwood spotted one client’s congenital heart failure and directed him toward medical help. Sigur described a Freret Street as it was decades ago, when he started at the barbershop, then called Tom’s Barbershop. There were three hardware stores, clothing stores, a wig shop, a tire shop, and a pharmacist—not the restaurants, upscale cocktail bars, and coffeeshops of today. People, he said, cycled through his barbershop all day, not only for cuts but for company. After work, Sigur himself fell into the cycle, visiting friends late into the day. “You wouldn’t make it home because you were going from house to house,” Sigur said. Freret Street and the surrounding area was what Norwood described as a “walk up community,” where people would walk in to different shops to simply hangout. After Hurricane Katrina, the residential make-up shifted in the Milan neighborhood, which encompasses the Freret shopping district, census figures show. The social climate also was transformed. “Now, I can stand on the street for 30 minutes and no one will talk to me,” Norwood said. In 2000, according to The Data Center’s compilation of census records, Milan was 74 percent black and. 22 percent white. By 2016, the black or African-American population had dropped to 55 percent of residents and the white population had risen to 38 percent. The average income also rose, climbing from $51,174 to $62,632. And 43 percent of residents now have some form of college degree, whereas before only 28 percent had earned a degree. Rent prices rose, and Norwood saw the new residents swaying development. Average home rental cost has jumped from $909 to $1,089 a month. Residents and business owners alike could not keep up. Businesses that could afford the higher rents, opened, selling at higher prices. Business, however, at Dennis’ Barber Shop has remained strong, but the shop community is only one part of piece of this success. In 1981, Sigur bought the building Dennis’ Barber Shop occupies, insulating him against the rising rents. He believes it is in part what has allowed the barbershop to remain open. The few other businesses still on the street from the time Sigur refers to as “before,” such as Bean’s Formal Wear and the Freret Hardware & Paint, also own the buildings they occupy. 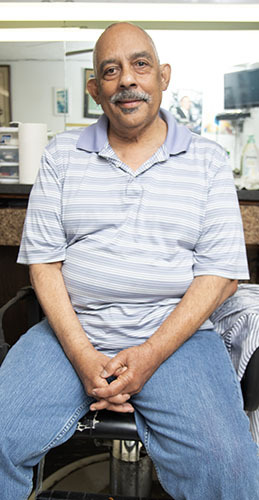 Norwood, who has served as the president of the Milan neighborhood association Neighbors United, recounted an instance when a man approached him and asked if he wanted “to sell [the shop] and go to a place that’s more conducive to your kind.” By “kind,” Norwood said, the man meant African-American. 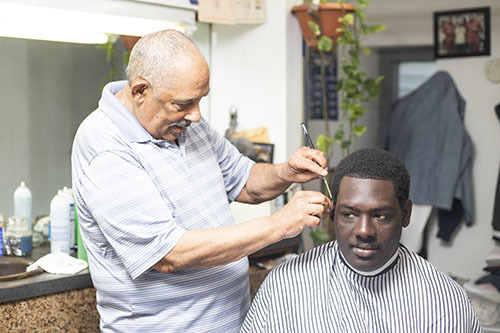 Dennis’ Barbershop has no plans to relocate, and continues to foster congregation. They maintain “stay true to the customer,” in Stockman’s words, “and treating everyone we with respect and friendliness no matter who they are.” The people, in turn, continue to come. “You should come in here after a game,” Oubre said with a smile. It’s packed, she said.